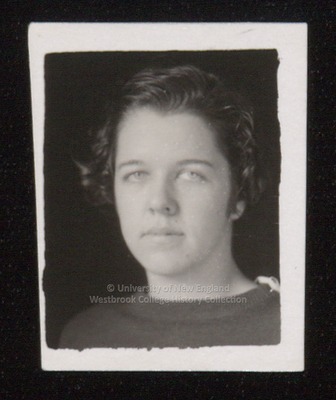 A ca.1934 Westbrook Junior College student portrait has written in pencil on the back B. Seavey. Miss Seavey's dark hair is softly waved and curled over her ears. She wears a dark sweater with a crew neck and white button tab on the shoulder.